is it possible for you to post a picture of that trade? As you know, I am an MTP user as well and just never seemed to be able to mesh Taylor and MTP together on a regular basis. ( I am more of an MTP standard trader)I am still interested in the ways that you trade the two together. Thanks. As you probably know, I dont use MTP in the pure conventional way. In this case there is no signal on the 3 min chart and there is probably one on the 1 min. 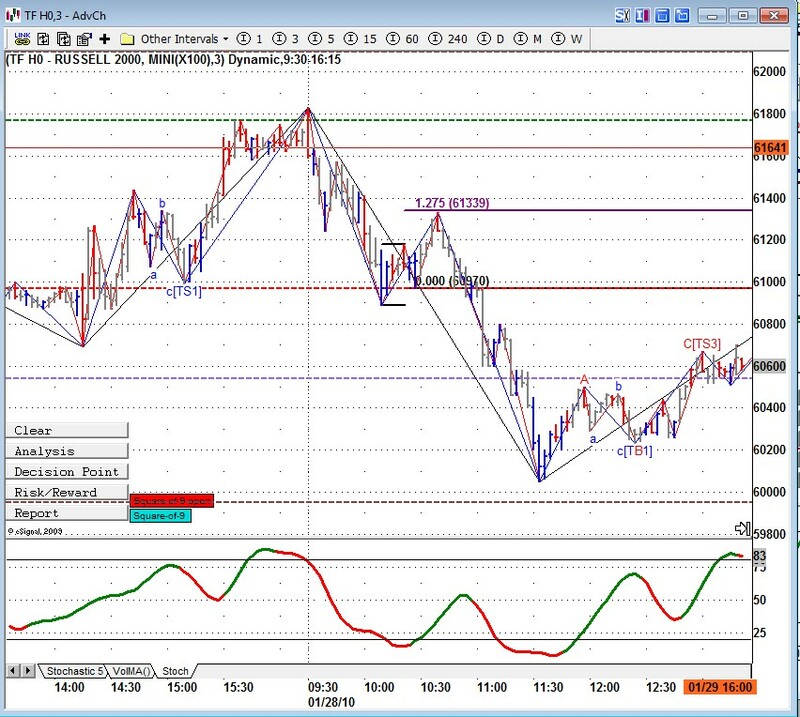 However If you look at the minor wave pattern and put your own fib extensions on it, you see a very nice ABC. At this point since we were on a SS day and looking for any excuse to short due to the faliure on the PH, I was not looking for only conventional signal but also any thing that looked good. I also use range charts where we had a TS2. SS DAY- my 3day rally projection of 1084 was achieved in the globex session and now the penetration projected price of 1092 has been breached. Do these match your readings? As there was no BV, I suppose you would refrain from taking long trades. As I may have mentioned, I only go by one month's data, hence my levels are not as accurate as yours, but I am only using them as guide. The main play of the day is more interest. We expect rally on SS day, however I will have to re-read Taylor to see where the testing of Sell day high and staying above that is mentioned. Perhaps you know the page numbers or chapter. When you say textbook SS day, did you take longs? thought the textbook play was going short on high made first. I my case I trade TF and noticed at the open that NQ and ES had made the objective so I figured they would go higher in order for TF to get there. My best trade was at 11.13 EST when we made a nice ABC down close to the PH so I went long on that one. Fair enough, I take into price action as well to dictate entry, and adopt Taylor that way to todays markets, although it is not strictly Taylor method as per his book. So when you said textbook SS day, that's somewhat puzzled me as SS day in the book is strictly for shorting, only longs were on BV. That is the way I have managed to reduced his 95 page book to just a few pages. I also changed many of his abreviations and standardised them.